Semtech Corporation (Nasdaq: SMTC), a leading supplier of high performance analog and mixed signal semiconductors and advanced algorithms, announced that Germany-based PureLink GmbH, a global manufacturer and distributor of Professional AV equipment, has combined Semtech’s BlueRiver™ Software Defined Video over Ethernet (SDVoE™) technology with its new IPAV Pro Series products. PureLink GmbH develops, produces and markets products for professional presentation and media technology. Since 2006, PureLink has been one of the international branch leaders for digital connectivity solutions. As manufacturer and distributor, PureLink partners with wholesalers, mail order companies, industry, planners and installers. The product portfolio comprises consumer equipment, as well as individual customer solutions. Professional products from leading international manufacturers complete the wide range of own-brand products. The company’s headquarters, including worldwide distribution and logistics centre is located at Rheine, Germany. For more information, please visit www.purelink.de. Semtech’s BlueRiver™ platform brings the disruptive power of Ethernet to AV signal distribution, forever changing the dynamics of the Pro AV industry by allowing installers and OEMs to replace proprietary AV matrix switches with off-the-shelf Ethernet networks that deliver dramatically better price/performance, flexibility and scalability. 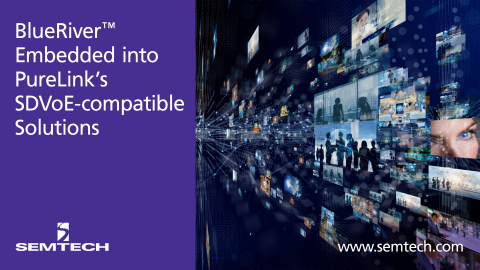 The BlueRiver platform delivers a single programmable system on chip (SoC), which can be used to replace traditional AV/KVM extenders, matrix switchers, video wall controllers and windowing processors with a simple network of transmitters, receivers and off-the-shelf Ethernet switches. BlueRiver chipsets are the foundation of SDVoE technology offering zero-latency, uncompressed 4K streaming over standard Ethernet with unique support for HDMI 2.0a and HDR. They also integrate high-fidelity video scaling, windowing and audio downmixing. For more information, visit www.semtech.com/products/professional-av/blueriver.